The Great Lakes are known for their sweeping beauty and crystal clear waters. They are a destination for recreational boaters and fishermen. Tourists spend billions of dollars in the eight states and two Canadian provinces that share the lakes’ 10,000 miles of shoreline. But hidden beneath the surface of the lakes, dozens of pipelines carry oil and gas every day. One of them lies underneath the waters of Michigan’s Straits of Mackinac. A recent analysis shows more than 5 million jobs are directly connected to the five Great Lakes, generating 62 billion dollars in wages. More than 40 million people get their drinking water from the Great Lakes. 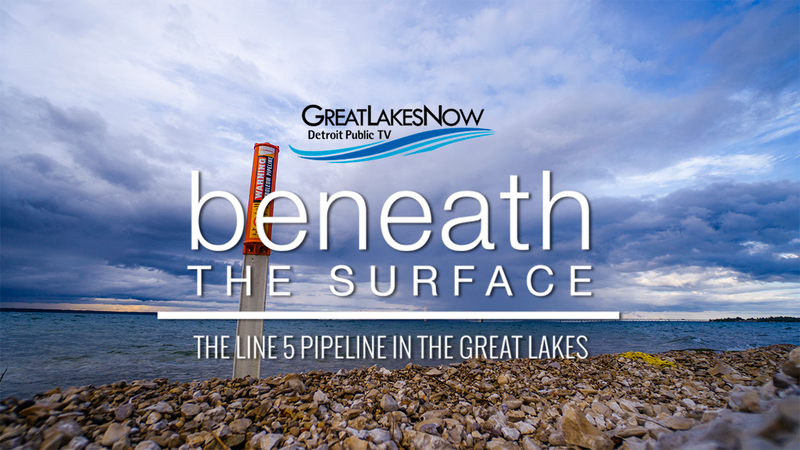 In this new half-hour documentary, Detroit Public TV’s Great Lakes Bureau examines the controversy surrounding the Line 5 pipeline built by Enbridge Inc., a pipeline that was constructed and placed on the lakebed between Michigan’s Lower and Upper Peninsula more than a half century ago. It operates under the water near the Mackinac Bridge in a spot that’s considered one of the most scenic areas of the Great Lakes and is known for its strong currents between Lake Michigan and Lake Huron. This film will take viewers on a journey across the Great Lakes to hear voices on all sides of this issue, including residents who live in a community devastated by the nation’s largest inland oil spill along Michigan’s Kalamazoo River. The spill was created by a pipeline owned by Enbridge, and the disaster made the public aware of Line 5. We’ll talk with environmentalists and residents who worry about the potential damage to the lakes they love. We’ll hear from scientists who have mapped out and made models of Line 5. We’ll take a ride on a ferry underneath the massive Mackinac Bridge and to historic Mackinac Island. We’ll interview petroleum experts and manufacturers who point out the vital importance of easy and affordable access to oil and gas for heating people’s homes in the winter and for manufacturing many of the products that drive Michigan’s industry. We’ll hear directly from Enbridge about Line 5 and the way the corporation has tried to learn from its mistakes. The film will show how Line 5 was an engineering marvel of its time, and was originally built to be a safer way to transport oil across the Great Lakes. We’ll meet tribal leaders who are filing a lawsuit against Enbridge and believe they have the right to shut down the pipeline because it has violated their tribal laws and treaty rights. We’ll see how the controversy over the pipeline has transcended politics and raised awareness about the use of our natural resources and the vital importance of clean drinking water. Along with interviews and archival footage, stunning visuals have been captured from the land, air and water that will highlight the grand scale of the Great Lakes, and show the way people rely on them for their health and for their future. Fred A. and Barbara M. Erb Family Foundation, Consumers Energy Foundation, The Richard C. Devereaux Foundation, Eve & Jerry Jung, The Polk Family Fund, Timothy Wadhams, Americana Foundation, The Carver Family, Paul R. Dimond, Amherst & Janeth Turner, Bruce Wallace & Susie Cannell, Phillip Roos, Mary Quilling, Tony Infante. Fred A. and Barbara M. Erb Family Foundation, Consumers Energy Foundation, The Richard C. Devereaux Foundation, Eve & Jerry Jung, The Polk Family Fund, Timothy Wadhams, Americana Foundation, The Carver Family, Paul R. Dimond, Amherst & Janeth Turner, Bruce Wallace & Susie Cannell, Phillip Roos, Mary Quilling, Tony Infante and viewers like you.